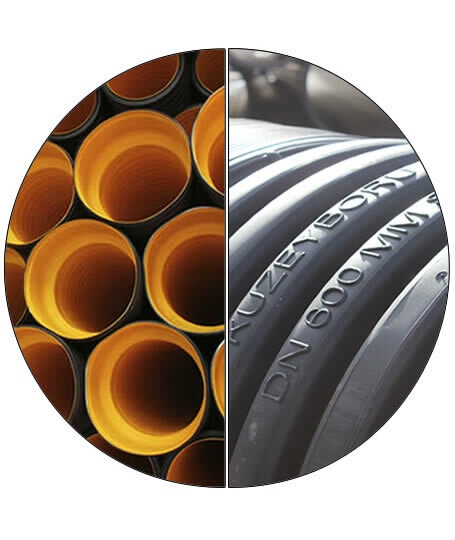 Kuzeyboru is manufactured corrugated pipes with the diameter from 100 mm to 1200 mm as self muffed corrugated pipes or spiral wound according to international standards of EN 13476-1 and DIN 16961-16566. Also we are able to produce in desired diameters and lenghts as per the client demands. Since it is produced in all diameters as muffler type and it does not require extra sleeve and saves workmanship. Since it is made of polyethylene raw material; corrosion resistant, high abrasion resistance and excellent resistance to chemicals, it is ideal for long-lasting sewage systems. The corrugated pipes are joined together with a sealing coupler and a sealing gaskets in own muff which supports easily assembled in any kind of construction site environment. Exact tightness is ensured as 0.5 bar pressure. Sewage wastes do not leak into groundwater. Telescopic stacking facilitates storage and transport. Corrugated Pipes are very lightweight and resistant to impact. It does not waste during transportation and storage. The Corrugated Pipe is light, heavy equipment is not needed during laying. The project speed is more than other pipe materials thanks of the easy joining methods of corrugated pipe. The inner surface of the corrugated pipe is made in light color, it allows the network to be controlled by the camera when requested. The hydraulic roughness of corrugated pipes is very low compared to other pipe materials, a low diameter can be selected and used by going to the diameter optimization in the sewage system. So, the project cost can be reduced. The smoothness of the inner surface prevents the solid particles in the system from adhering to the pipe surface and prevents the narrowing of the cross-section that can occur over time. The corrugated pipe is flexible, it is not affected by ground movements, it does not deform. The life of corrugated pipes is at least 50 years. The layer compression should be done that there is no space around the pipes while the channel is being filled. Especially it should be ensured that the pipe is filled with filler material. The filling is done by compressing well according to the condition, the traffic and soil load coming to the pipe are transferred to the filler and it fulfills its function throughout the pipe life. Otherwise, when the around is empty, the pipe will overflow its own weight, and if it can not find a place to transport the forces above it, it will collapse. The same applies to steel pipes. For Electro fusion joining systems, slipers such as soap and silicone should be used to penetrate the pipe sides. Before electrofusion, the surfaces should be checked for cleanliness. The wire must be careful before the source that it does not touch each other. Pipe diameters is used in the calculation of the ring rigidity (SR) calculated according to the DIN standards and the ring rigidity (SN) calculated according to the pipe diameters, CEN and EN standards. ✓ High resistance to corrosion due to being Polyethylene and Polypropylene. ✓ Guaranteed life for external effects is at least 50 years and can be used for 100 years. ✓ Plastics are more resistant to flow because the hydraulic is smooth, and the fluid flows with a higher filling rate. This reduces project costs by selecting a lower diameter group in the project. ✓ No product losses during application. ✓ As the density of concrete and casting is very low, the requirement of the machine goes down to the minimum level. 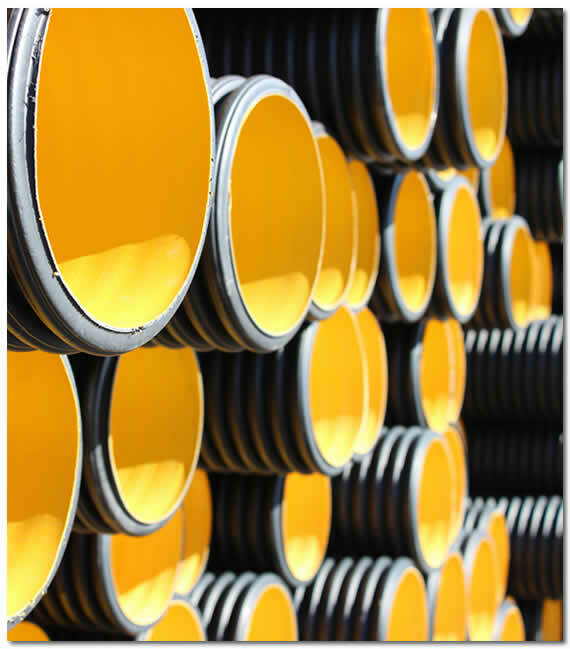 ✓ Because of its high abrasion resistance, it does not allow penetration of underground waters and soil by drilling. ✓ Even if the floor is pebbly, it prevents breaking by stretching inwards from that area. ✓ It does not allow trees to leak through the channel. ✓ No product loss during application. ✓ All kinds of connection parts allow to be produced for special project products. ✓ When combined with electrofusion, it does not leak even at 4 bar pressure, it does not spread out. ✓ It is not affected by earthquake and broken. ✓ Can be used in river, lake and sea pass. ✓ Pre-treated water from treatment plants can be used for sea-going drainage.